Georgina Chapman, Henry Holland, Josh Rubin and Jessica Schwarz are among 40 influential names from ten cities, working in fashion, design, music and film who will collaborate with Range Rover over the next 12 months to launch the highly anticipated Range Rover Evoque. Each of the influencers has been recruited to participate in the Pulse of the City project where their journeys will be tracked around their favorite cities to create a living interactive guide to the urban spaces they call home. The influencers or 'City Shapers' have been chosen because they are influential in their cities and have interesting points of view that people listen to. They come from different aspects of culture that make up the varied nature of their cities, from arts, the creative industry, film, music, fashion, media - anywhere where they've made their own mark and shaped the cities they live in. In a world first, the 'Pulse of the City' app, launches on iPhone (android available from mid November) and uses GPS tracking to record the collective movements of people within the ten cities. 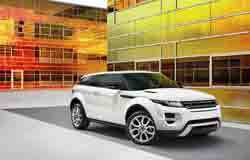 Users will be sent a graphical representation of their journey which they can display on the Helloevoque.com website. Participants will also be able to add comments about their favorite walks, hot spots and journeys, creating a real time, evolving pulse of each city. Both 'City Shapers' and the public will be able to download the app for free. Inspired by the new Range Rover Evoque and the cities that in turn inspired its design; the app will bring each city to life through the people who shape it.